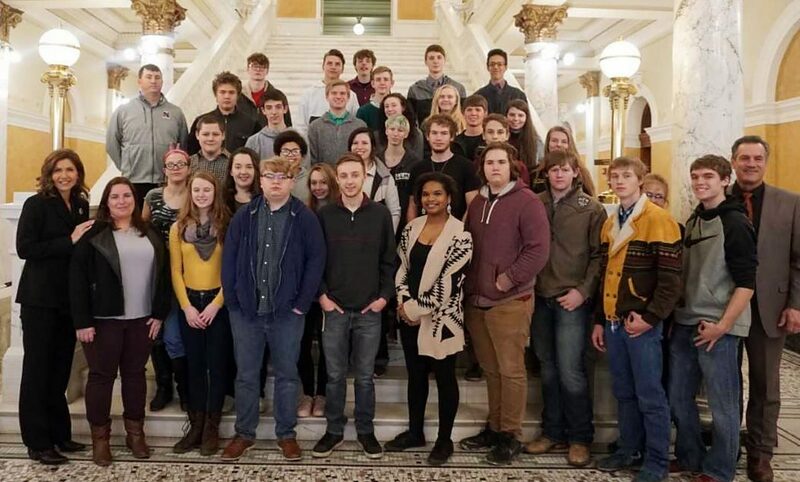 The Newell Junior and Senior Class loaded the bus at 5 am MST and headed to Pierre, SD on Tuesday, Jan. 15, 2019, to visit the Capital. They arrived in time to sit in on a few morning meetings. The students were very interested to hear about some of the issues the Game, Fish and Parks is working on to interest young hunters and trappers. Ryan Brunner with the Commission of School and Public Lands also presented during one of the meetings about the sale or trade of school lands to help raise more money for education. Governor Kristi Noem and Lt. 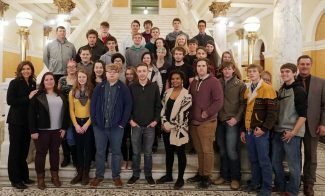 Governor Larry Rhoden took the time to visit with the students and tell them about their goals for the future and gave them time to ask questions as well as take a picture with them on the capitol steps. They explained how this is the first time in the history for South Dakota to have a woman Governor and both the Governor and Lt. Governor that have agriculture as their way of life. The students hosted a sack luncheon for their local representatives and the Constitutional Officers in the Visitor Center. Those individuals took the time out of their day to come and visit with the students during the lunch break about what their job entails and answer any questions the students had. The students heard from the Constitutional Officers: Steve Barnett, Secretary of State: Jason Ravnsborg, Attorney General; Ryan Brunner, Commissioner of School and Public Lands and a Newell graduate; Chris Nelson and Kristie Fiegen, Public Utilities Commissioners. Local Representatives Thomas Brunner and Sam Marty along with Senator Gary Cammack also visited with the students. Our former Representative, now Lt. Governor Larry Rhoden, also spoke with the students about how government works and answered questions that the students had. Senator Gary Cammack said he was pleasantly surprised at all the great questions the students asked. The representatives encouraged the students to apply to be a page for next year's legislative session. Following the luncheon they had time to do a short tour of the capitol before sitting in on the afternoon sessions. Senior Amanda Nehmer said, "I enjoyed the trip to Pierre and learned a lot that I didn't know before. It was very interesting" and Victoria Tucker stated, "I liked going to the capital because I got to see our government in action. It provided a better understanding of what's going on. I like that the Governor and other officials took their time to explain their different duties and responsibilities. Overall it was a great experience."